Art is for everyone – this sentiment seems to echo more and more across Lebanon’s art scene and is the central vision of the Association for the Promotion and Exhibition of the Arts in Lebanon (APEAL). In addition to launching plans for a free contemporary art museum, the Beirut Museum of Art (BeMA), the organization is thinking outside the capital’s borders, with plans to bring art to more neglected areas. During the fall of 2016, APEAL worked together with the Zoukak Theatre Company to engage an unlikely group of people – elderly residents of Baalbek – in a community outreach program that included a theatrical production in the town’s historic Roman temple. Award-winning Lebanese director Roy Dib was commissioned to create a documentary following their journey. Besides documenting rehearsals, Dib interviewed participants individually, inquiring into their personal relationships with the city and asking them to show him around their favorite places. The beautiful, hour-long film, “Serrak Sahel (Plain Secret),” is itself a work of art. It offers a glimpse at the hidden gems of Baalbek, narrated by conversations with locals who know their city incredibly well and showing sides of Baalbek that outsiders don’t normally see. It premiered on March 21 at the Metropolis Cinema Sofil and is now available online. While the majority of Lebanese know of the city’s grandiose Roman Acropolis, a UNESCO World Heritage Site and among the most impressive Roman ruins in the world, there’s a lot more to the living, breathing city of Baalbek, one of Lebanon’s most legendary and misunderstood cities. Far from the tourist-drawing temples, the documentary shows a ravine leading to caves that allegedly stretch for hundreds of meters underground, as revealed by program participant Omar el-Solh. In today’s Baalbek, Batoul Kasem, a midwife with the Red Cross, takes viewers into the Ras el-Ain public park, while Ahmad Kassab, a long-time employee of the famous Palmyra Hotel, reminisces about the landmark inn. Imad Mortada allows cameras into his private garden, the site of a small local recycling project, and agricultural engineer Hadi el-Miselmani is interviewed in a local cafe he’s been frequenting since childhood. The film follows the process of putting together a theatrical production with elderly residents, who have never done anything like it before. Participants contributed to the writing of the storyline and script, and performed it in front of a live audience all within a few days. Creating and performing the play helped residents explore their own relationships with the heritage and history of their surroundings, as well as with their own identities. 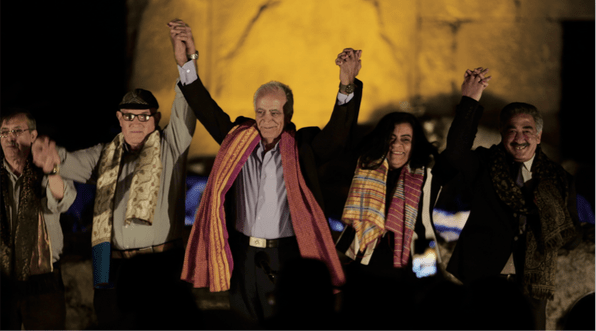 The final performance saw the amateur actors stand on the same stage as the legendary acts who have graced the Baalbek International Festival. Though the festival draws thousands of visitors every summer – and their money – the influx of outsiders has caused a disconnect between citizens of Baalbek and their city’s famous attractions. Nada El Khoury, artistic vice-president of APEAL, explains that the production was timed to coincide with “The Silent Echo,” a contemporary art exhibition organized at the Temple of Bacchus by Studiocur/art. The first-of-its-kind show featured Lebanese and international artists, including one of the most acclaimed artists of our time, China’s Ai Weiwei. Held from September 17 – October 17, it shed light on the importance of on-site museums, and explored how monuments and artifacts become symbols of an obsolete past, subject to destruction, iconoclasm and erosion, raising issues of preservation, ethics, and questions of how to best preserve the vestiges of the past. El Khoury says they chose to work with the elderly because “they are the origin and the memories [of the city], telling the stories of Baalbek,” and that it made sense to run the two historical projects in parallel. El Khoury says APEAL’s mission is to give people from all areas of Lebanon and all walks of life the opportunity to experience art: “We believe art is the best language.” Unfortunately in Lebanon, it’s often a language people are afraid to learn. El Khoury agrees that even free cultural spaces can be intimidating for the general public, but that APEAL is working to combat this feeling. “Art shouldn’t be intimidating. That’s why we are going to people, to villages, and we are telling them you shouldn’t be scared to step into a museum, on the contrary, [they should feel welcome],” she says, adding that many museums are shifting their strategies to become more inclusive. The Baalbek initiative follows on the heels of APEAL’s art residency and exhibition at Ras Maska, Koura, in spring 2016. This May, APEAL plans to continue its mission to bring art to communities around the country by going to Jezzine, where they will host a month-long art residency program and several cultural events.